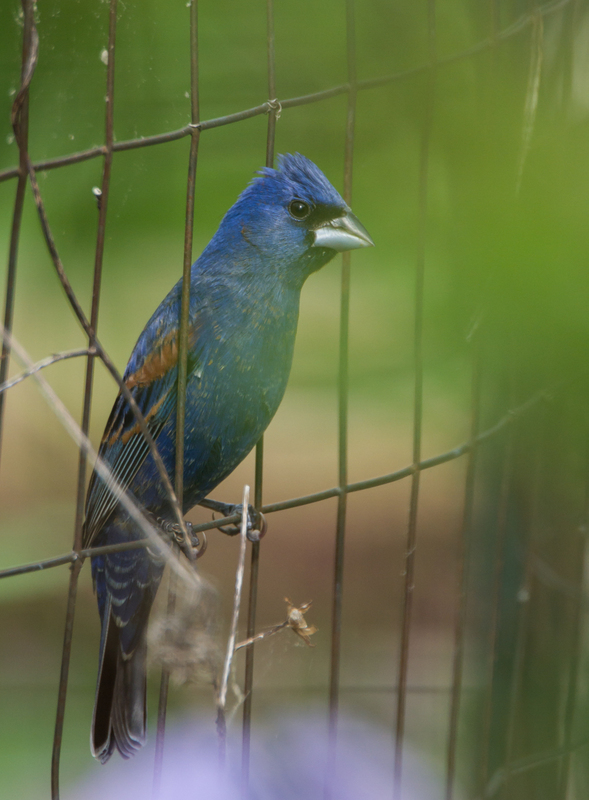 Its pleasing song and engaging appearance have made the [blue} grosbeak a favorite cage-bird among the southern [people], who know it as the “blue pop”. 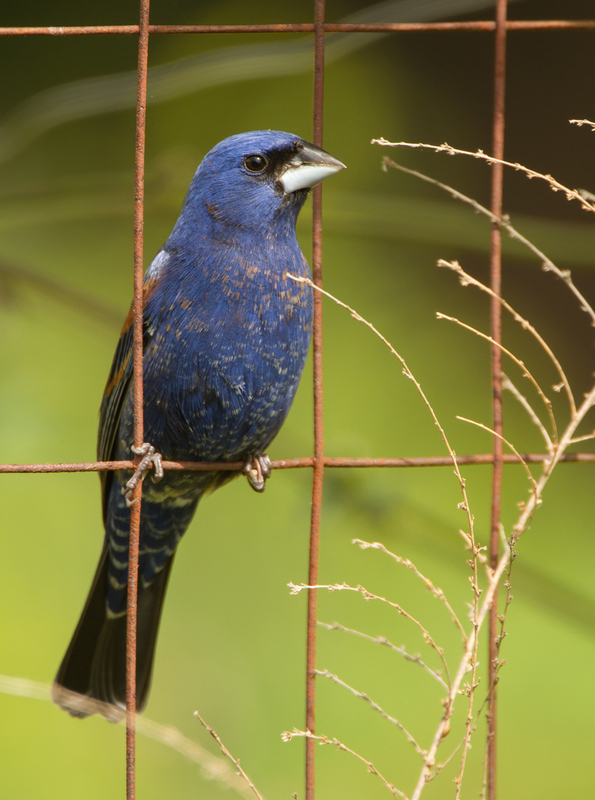 Though many wild birds were often kept as cage-birds decades ago (and still are in some areas of the world), I am glad the Blue Grosbeaks I am seeing are free and on the wing. They prefer shrubby and open habitat like those found along the power line right of way, so I see a few every summer. But I was very pleased with how many I saw last week as I staked out the garden area for migrating birds. The only problem was they were less than cooperative about having their picture taken. A couple of males visited the garden and spent time on the ground, foraging for insects. I believe they were also eating some of the seed heads of the wheat straw I put down to help control weeds. But, until a few days ago, they always managed to keep hidden amongst garden plants or the grape vine. One female (who is brown in color) showed up for about 20 seconds one morning and then flew off down the power line. But, that was enough to get two males going and one finally landed in the small Black Cherry tree I have allowed to grow alongside one of the garden beds (as a host plant for various caterpillars). He still was partially blocked from my camera’s view by the top of the fence and some leafy branches in the foreground, but you could tell what he was at least. After a couple of minutes, the brilliant blue male flew up to a branch tip and was in full view. They are beautiful birds, with an intense blue color all over, except for some rusty brown on their wings, and black at the base of the beak. And that beak is impressive – large and silvery in color, making for a striking contrast to the black and blue of their head. Blue Grosbeak male showing the brownish edges on some feathers. These will wear away in coming weeks leaving an all blue coloration except for the wings. 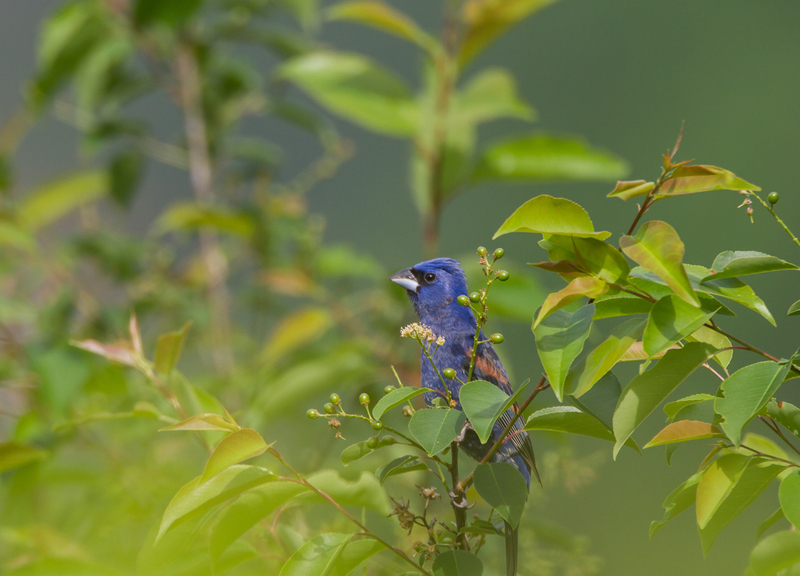 Their coloration and similar habitat make male Blue Grosbeaks easy to misidentify as Indigo Buntings, but Blue Grosbeaks are larger (especially the head in proportion to overall body size), have a much larger beak, and have the chestnut wing bars. 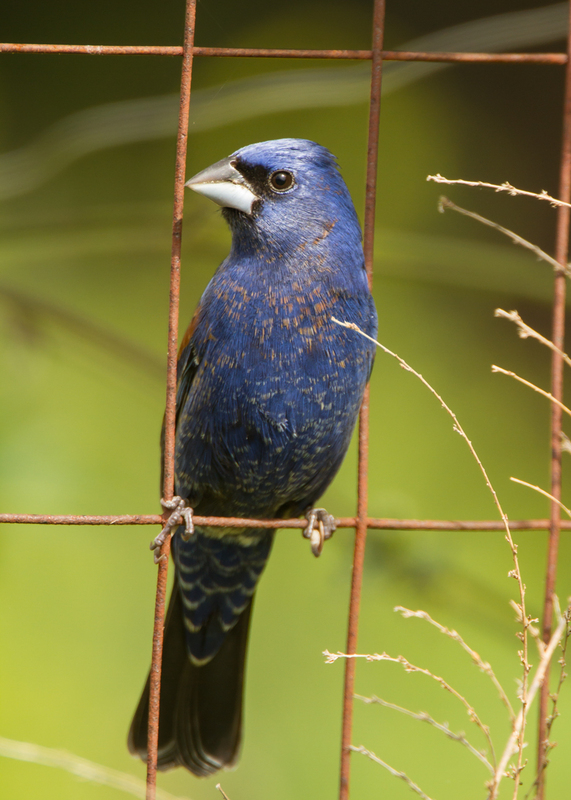 The all brown female Blue Grosbeaks are even more similar to female Indigo Buntings, but, again, the beak and presence of chestnut wing bars can help differentiate the two species. I will keep my eyes open for nesting behavior as I walk the power line in coming weeks. 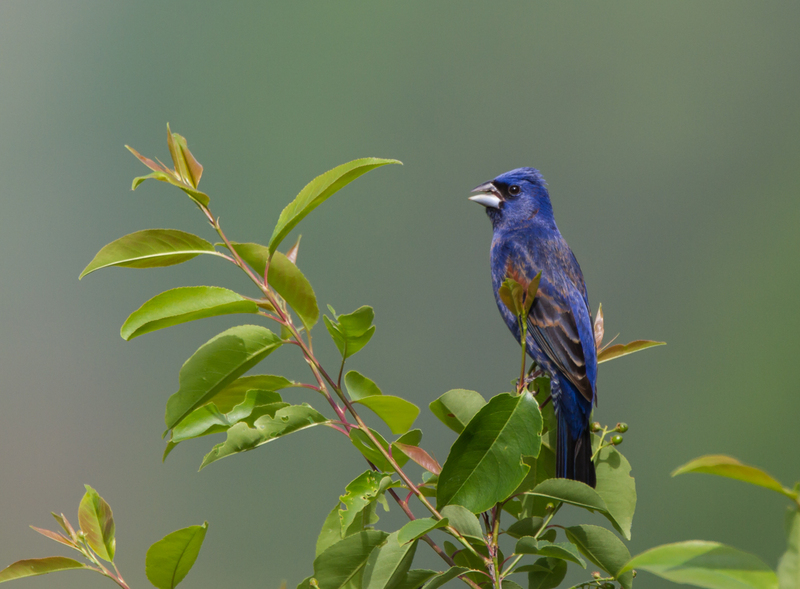 Blue Grosbeaks build a compact nest low to the ground in shrubs, vine tangles and small trees. I have found nests at the Museum’s field station at Prairie Ridge, but hope to see one or more close to home, so I can learn more about the behavior and food habits of these striking birds. If I could only get the male Blue Grosbeaks, Eastern Bluebirds, and Indigo Buntings to perch on the same snag…now that would be a picture. This entry was posted in Natural History by roadsendnaturalist. Bookmark the permalink.